Bairappagari MEJ, Thompson KJ, Daniel E. 5 January 2017, posting date. The eye in leprosy. In Scollard DM, Gillis TP (ed), International textbook of leprosy. www.internationaltextbookofleprosy.org. Ocular manifestations in leprosy have traditionally been categorized as those directly related to leprosy and those that are not directly related to the disease. Such categorization is set to become increasingly less relevant due to several reasons: the availability of effective, early treatment for leprosy has resulted in decreasing ocular complications unique to leprosy; the longevity of patients has in turn increased the occurrence of age-related ocular complications among leprosy patients; the integration of specialized leprosy services into the general health care system has altered the role of primary health care workers to evaluate any cause of decreasing vision rather than only ones that are directly related to leprosy; and more often than not, especially in bacteriologically cured leprosy patients, distinguishing leprosy related ocular complications from those that are not directly associated with the disease is difficult. The results of a multi-centric longitudinal study of ocular leprosy (LOSOL) showed that approximately 3% of multibacillary (MB; see Chapter 2.1) patients were blind at the time of starting multi-drug therapy (MDT; see Chapter 2.6), with 11% having potentially sight-threatening ocular manifestations (PSOM). During the course of two years of MDT, another 6% developed PSOM, and during the next five years of follow up, an additional 4% developed PSOM. It is likely that, overall, 1 in 5 treated MB patients will have some form of PSOM. Several important lessons were learned from the LOSOL. First, leprosy patients who had already developed ocular complications before they were adequately treated can continue to have PSOM. Second, MDT by itself is not a safeguard and many of the ocular complications can develop during treatment. And third, bacteriologically cured patients who are not classified as patients anymore still have the potential to develop blinding ocular complications , , , . The stigma of leprosy continues to persist globally as a significant deterrent to patients seeking good eye care. Apart from learning to recognize the early signs and symptoms of PSOM in leprosy patients, a key component for the training of health care workers in this field is gaining a sense of responsibility to facilitate early eye care access to ophthalmologists and physicians for their patients. In this chapter, we address some of the main PSOM that occur among leprosy patients and invite the reader to explore more detailed accounts in the references that have been cited , , , , . A cataract is the most common cause of visual impairment and blindness in leprosy patients. Most often, it is age-related; less often, it may be due to prolonged steroid use in treating nerve inflammation. Least often, it is due to chronic iridocyclitis, which is mostly sub-clinical  (Figure 2). FIG 2 Causes of cataract. Age-related cataract: The pupil has been dilated with a mydriatic and the cataract shows evidence of both nuclear cataract (yellowish opacity in the center) and cortical cataract (small spokes at the periphery). 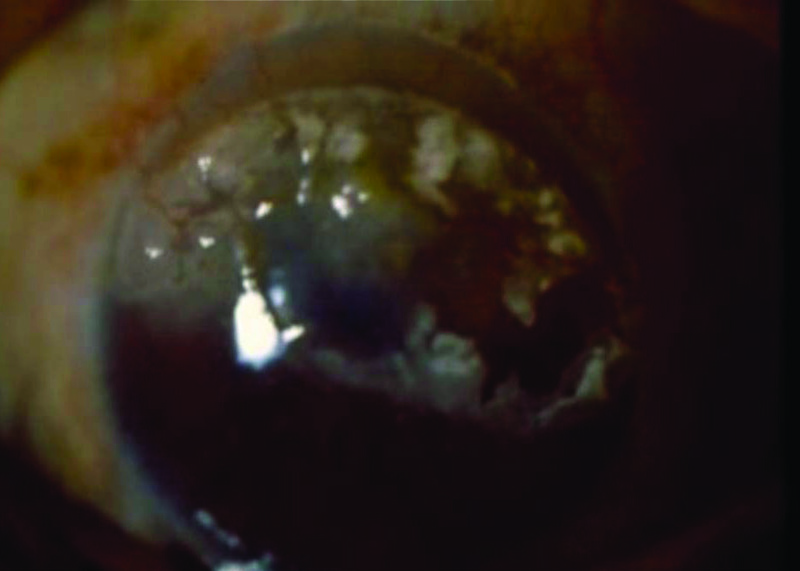 Steroid induced cataract: Posterior sub-capsular cataract in a leprosy patient receiving prolonged treatment with oral steroids for chronic nerve pain. Typically, the opacity is in the posterior part of the lens. Small areas of iris pigment are seen on the surface of the lens with the cataract in a patient with chronic iridocyclitis. Shows an irregular pupil and the iris appears to be stuck to the anterior surface of the cataractous lens. C and D are cataracts associated with iridocyclitis/uveitis. Reproduced with permission . Copyright 2015, Jaypee Brothers Medical Publishers Pvt. Ltd. Surgery is currently the only curative treatment for a cataract (Figure 3). The surgical removal of cataract and intraocular lens implantation has been found to be safe and beneficial for patients with leprosy , , . However, the final visual outcome may be affected by other ocular co-morbidities, such as corneal scarring or sequelae of iridocyclitis (more common in long-standing MB leprosy). In cases of iridocyclitis induced cataract, the eye must be rendered quiet pre-operatively (with no redness or inflammatory cells in the anterior chamber) using topical steroids. Pre-operative and post-operative cover with corticosteroids will help reduce the occurrence of intraocular inflammation. FIG 3 Management of cataract. Right eye of a lepromatous patient who had cataract surgery by intracapsular cataract extraction (ICCE): No intraocular lens was implanted and there is a large, complete iridectomy. Patient required thick glasses for corrective vision. These types of surgeries were common before the advent of extra capsular cataract extraction (ECCE) and intraocular lens implantation. They are uncommon now and only warranted in cases in which inflammation/uveitis has made ICCE the only option for removing the lens without causing additional damage. Even after the usefulness and safety of intraocular lenses were proven in the general population, there was reluctance to incorporate these important advances in ophthalmology into leprosy. Mainly, there was concern that implanting intraocular lenses after cataract removal would cause catastrophic uveitis, ending in blindness. This outcome was shown not to be true even in lepromatous patients who had very high bacillary counts. The eye of a lepromatous patient after phacoemulcification and intraocular lens implant is seen here. The patient’s vision improved from 6/60 to 6/9. The recovery is fast and no hospital stay is required. Most importantly, the patient does not need to wear thick glasses, which is a great impediment for patients with nasal deformities. Cataract surgery had been done in this patient, who developed a thick vitreous opacity and whose best corrected visual acuity was only hand movements (HM). Laser treatment opened up the vitreous opacity and improved his vision to 6/18 with best corrected visual acuity. Using state-of-the-art technology in appropriate situations can improve the visual status of leprosy patients, improvements that would not have been possible five decades ago. Due to stigma, access to modern eye care facilities is still out of reach for many leprosy patients. Therefore, reducing the barriers that preclude a high standard of eye care and surgery for such patients remains a challenge , . Lagophthalmos is the inability to close the eyelids normally (Figure 4). The orbicularis oculi muscles that close the lids are innervated by the facial nerve through its zygomatic and temporal branches. As these course over the zygomatic area towards the lids, they are superficial and susceptible to inflammation and damage. The palpebral fibers are affected before the orbital fibers, and initially the patient may have only nocturnal lagophthalmos (sleep with cornea exposed), retaining the ability to voluntarily close the eyelids. The lower lid is usually the most affected. Lagophthalmos is not only a cosmetic deformity but also, along with decreased corneal sensation, can lead to corneal ulceration and opacity. A decreased blink rate is usually evident in these patients. The eyes of this patient (left image) look normal. Only by making the patient close his eyes is the examiner able to see that there is gap in the palpebral fissure on gentle closure. Early Lagophthalmos can often be treated successfully with medicine. The examiner will miss this vital sign of early lagophthalmos if the patient is not asked to voluntarily close his or her eyes as part of the examination. The amount of lagophthalmos is proportional to the extent of the damage to the facial nerve. If there is mild weakness of the orbicularis oculi, the eyelids may appear normal. Therefore, it is critical that the voluntary gentle closure of the eyelids is tested, as well as forced closure and the measurement of the mid-palpebral width recorded at every visit. Patients must also be educated to inspect their eyes for any redness or difficulty closing their eyes. Early lagophthalmos can be managed in several ways. Blinking exercises: Patients are taught to shut their eyes forcefully for a count of about 10 seconds, 10–20 times a session, for 2–3 sessions a day. This exercise strengthens the orbicularis oculi muscle fibers that have been spared. Tear substitute drops: The exposure of the ocular surface due to insufficient closure leads to drying, so the cornea needs to be kept moist and protected. Treatment options include instilling topical methyl cellulose 1% polyvinyl alcohol 1–3% drops or other equivalent topical lubricants several times a day and using a long-acting lubricant ointment at night. Wear goggles during the day. Cover the eyes at night with a clean piece of cloth. Use cross taping and shield (Figure 5). FIG 5 Protecting the eye from exposure. While receiving medical treatment for Lagophthalmos or waiting for surgery, taking simple measures to keep the eye protected from exposure is important. Taping the lid as shown in (A) or using a transparent protective shield or goggle (B) are simple, inexpensive but important measures. The surgeries commonly performed for lagophthalmos are discussed below. The most commonly performed surgery for lagophthalmos is a lateral tarsorrhaphy (Figure 6). A lateral tarsorrhaphy is a simple surgical procedure in which the lateral aspects of the eyelid margins are abraded and sutured together. The palpebral fissure is reduced in size and the lids cover the cornea better. The surgery can be performed medially, taking care not to damage the naso lacrimal canaliculi, instead of laterally if the eyelid gap or corneal damage is more medial. The cosmetic outcome may be poor and its long-term effectiveness is considered sub-optimal in some circles. Nevertheless, it remains an important sight-saving measure in situations with limited resources or expertise . FIG 6 Lateral tarsorrhaphy surgery. Corneal protection for Lagophthalmos may require lid surgery. A temporary tarrsorhaphy may be performed as shown in (A) and (B). A permanent lateral tarsorrhaphy (C) is a commonly used procedure, since it can be done easily in rural settings and is not expensive. It may, however, not be cosmetically acceptable to some patients. Other eyelid surgeries: The recession of the upper eyelid retractors (levator and Müller’s muscles) is a useful procedure. Another surgery is lower eyelid tightening and elevation. A tightening procedure such as a lateral tarsal strip procedure will improve apposition of the lower eyelid to the globe and decrease epiphora or lacrimation . In a temporalis muscle transfer (TMT) surgery , , a strip of tendon from the temporalis muscle (that is used for chewing) is undermined and split into two. Then each strip is tunneled subcutaneously along the upper and lower eyelid margins and sutured to the medial canthal tendon. The fascia lata or palmaris longus tendon may also be used. After surgical recovery, the patient is trained to close the eyes by clenching the teeth. This procedure is a dynamic one, which, in experienced hands, gives cosmetically superior results to the static corrective procedures described above (Figure 7). Well-trained surgeons and prolonged physiotherapy are required. Complications may include ptosis and ectropion  (Figure 8). FIG 7 Temporalis Muscle Transfer (TMT) surgery. The top images show bilateral lagophthalmos. After temporalis muscle transfer (TMT) surgery, the patient is able to close the eyes while clenching the teeth. The surgery results in a good cosmetic appearance. A Ectropion of the lower lid where the lids falls away from the globe and makes the tear film unstable and causes a dry eye. Gold weight implants: Gold weights can be implanted into the upper eyelid, enhancing eyelid closure by increasing the gravitational force. Gold, being inert, is considered the material of choice. However, migration and extrusion of the gold weight may occur . Two other eyelid deformities are entropion and ectropion. Entropion: The inversion of the eyelid margin is termed entropion, which predisposes a patient to trichiasis (i.e., lashes rubbing against the cornea). Trichiasis can result in superficial abrasions, which cause pain only if corneal sensation is intact. However, since the integrity of the corneal surface is threatened, entropion requires corrective surgery. Aberrant or misdirected lashes abrading the cornea require epilation. Surgery to rotate the eyelid margin, correcting the inversion, may be performed if there are five or more misdirected lashes. Ectropion: The eversion of the eyelid margins is termed ectropion. It is common in the lower lid of patients presenting with lagophthalmos. Unless it is minimal, tearing, dry eye, and redness result and surgical correction is necessary. Ectropion may also be caused by poor surgical technique in a TMT surgery (Figures 8, 9). This lepromatous patient had TMT surgery done in the right eye for lagophthalmos (A). The tendon has been misplaced further away from the lid margin, causing ectropion of the lower lid. Clenching the teeth (B) does cover the eye through the upper lid, but the lower lid ectropion had to be surgically corrected. 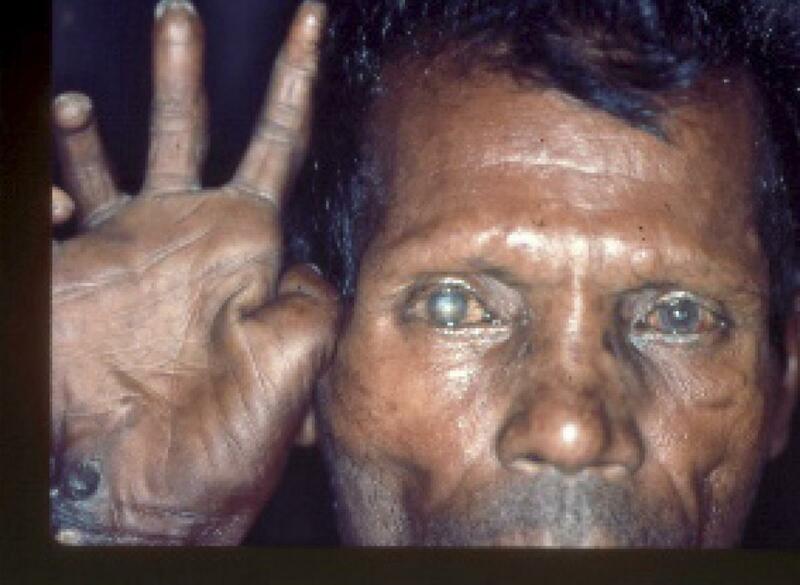 Reduced corneal sensation typically occurs in long-standing polar lepromatous leprosy. A cotton wisp is no longer recommended for testing corneal sensation unless it is done in a clinic environment. Sensation may also be tested quantitatively or by using the Cochet and Bonnet esthesiometer  (Figures 10, 11, and 12). FIG 10 Reduced corneal sensation. Although reduced corneal sensation is difficult to estimate, evidence of it can easily be seen in the cornea of long-standing lepromatous leprosy. The foreign body on the cornea was not felt by this patient who came in for a routine examination. Towel fiber marks etched on the corneal epithelium of a lepromatous patient who pressed a towel onto his eye to stop epiphora. 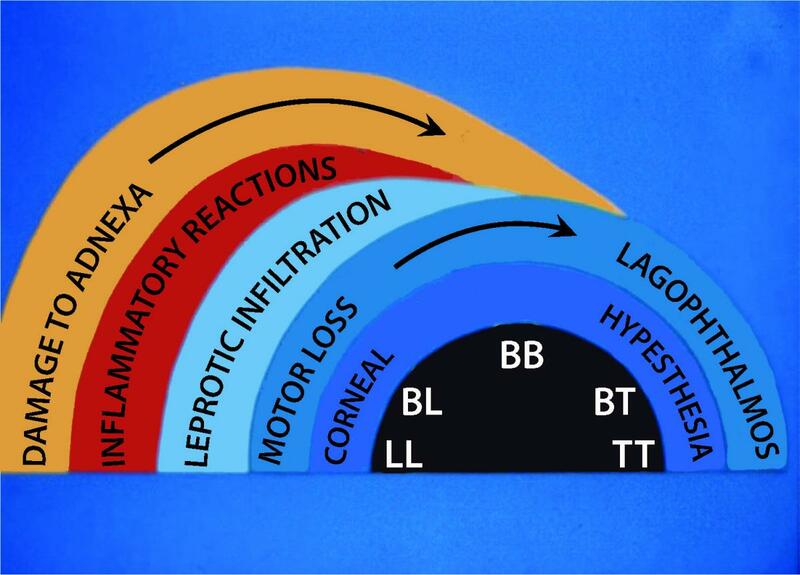 These are practical evidences of reduced corneal sensation that can inhibit pain and cause harm to the corneal surface without the patient experiencing discomfort. FIG 11 Estimating corneal sensation. Estimating corneal sensation should not be done in the field as it was once advocated, because it can cause damage to the cornea and end up as a corneal ulcer. Instead, it should be done with care in an ophthalmologist’s clinic and the cornea inspected after the test is performed with fluorescein eye drops. A quantitative measurement of corneal sensation can be done using the Cochet and Bonnet esthesiometer, but it is time consuming. This lepromatous patient with a calloused hand and ulcer transmitted bacteria to his sensation-reduced right eye by rubbing it and developed a corneal ulcer, which healed with treatment but left behind a corneal scar. Corneal ulcers may occur due to an acute microbial infection or as a secondary infection in exposure keratitis, resulting in opacification of the cornea. In both cases, risk factors include lagophthalmos, impaired corneal sensation, nasolacrimal infection, and infected ulcers on the hand. The hand ulcers can transmit bacteria onto the cornea when the patient rubs the insensitive cornea with his or her hand  (Figure 12). Acute corneal ulcers present with decreased vision, pain, and red eye. In patients with insensitive cornea, pain is often not a presenting symptom. These patients typically present late for treatment, when the ulcer has progressed, significantly decreasing the visual acuity (Figure 13). Lepromatous patient who did not recognize an early ulcer because of reduced corneal sensation. The eye progressed into endophthalmitis and was treated indigenously with herbal medicines. The patient developed a painful blind eye that had to be eviscerated. Corneal ulcers are medical emergencies and need immediate and rigorous treatment. Patients with suspected corneal ulcers should be referred promptly to an eye clinic. Fluorescein drops instilled on the cornea stain the ulcer and reveal its extent (Figure 14). Corneal scrapings should be taken carefully from the edge of the ulcer and sent for microbiological testing. Culture and sensitivity reports take time, often beyond 48 hours, but treatment should be commenced promptly nevertheless. The test results may help in modifying the treatment later, especially if there is no improvement. 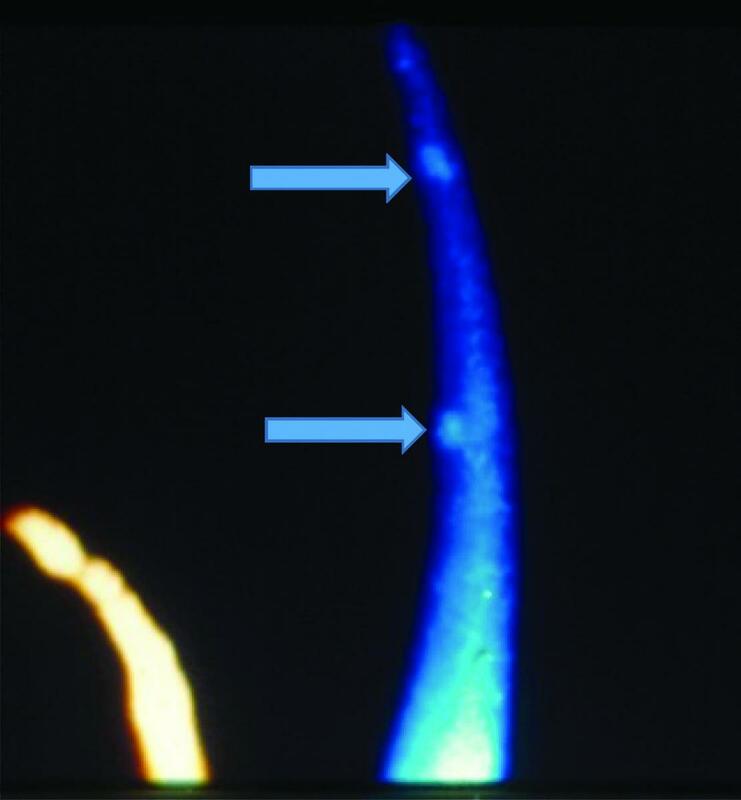 FIG 14 Staining with fluorescein drops. Corneal ulcer that stains green with the application of the fluorescein dye. Corneal opacity that does not stain with the fluorescein dye. Topical broad-spectrum antibiotic drops are the mainstay of treatment for corneal ulcers. They should be instilled in the affected eye every five minutes for an hour, and then every half hour to one hour until there are signs of improvement. Subsequently, the drops should be scaled back to 3–6 per day. Fluoroquinolones such as ciprofloxacin or ofloxacin, or a combination of cefuroxime and aminoglycosides such as tobramycin or gentamycin, may be used. The drugs are then altered depending upon the bacteriological and drug sensitivity results. The non-healing of ulcers may be due to (a) a different organism such as a fungal infection, (b) a resistant organism, or (c) local factors such as exposure due to lagophthalmos. A fungal infection should be suspected if there is a history of injury with vegetable matter or if the inflammatory signs such as redness and pain are excessive  (Figure 15). 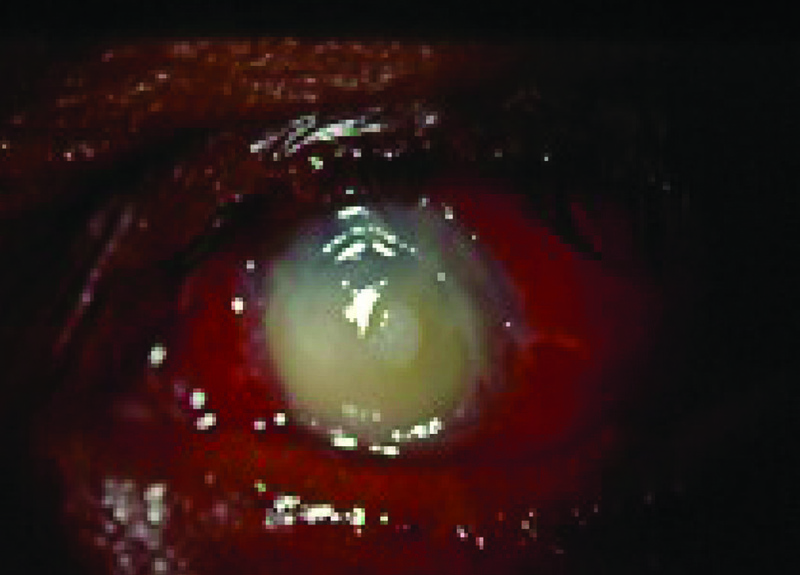 FIG 15 Fungal corneal ulcer. 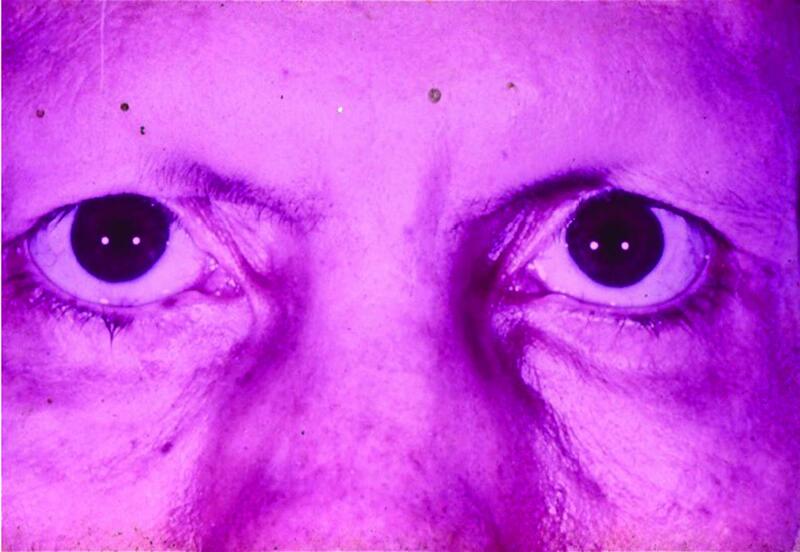 Lepromatous patient who developed a fungal corneal ulcer in both eyes at different times. The organism isolated was Bipolaris hawaiiensis. In this case, anti-fungal topical drops such as natamycin or 0.2% Fluconazole may be used. For deep ulcers, systemic therapy with oral ketoconazole is recommended. Lagophthalmos and corneal exposure may necessitate a temporary tarsorrhaphy. A mydriatic to relax the uveal tissue is given, along with oral NSAID for pain and inflammation. Exposure keratopathy: Pinpoint ulcers may occur in dry areas of the lower half of the cornea, which has been rendered susceptible by exposure due to lagophthalmos. An early tarsorrhaphy can help protect the cornea (Figure 16). Images of exposure keratitis, which typically develops in the lower halves of the cornea. The transparent cornea is now opaque with vessels travelling into the cornea. Dacryocystitis: Chronic dacryocystitis (inflammation and obstruction of the nasolacrimal duct) Orbicularis Oculi weakness impairs the lacrimal drainage pump mechanism. This impairment predisposes the eye to infection, which poses a threat by harboring infectious bacteria that can repeatedly infect a corneal ulcer and prevent healing. In every case of suspected ulcer, the patency of the nasolacrimal duct should be checked by syringing and, if it is blocked, surgery is required (Figure 17). Patient presenting with lagophthalmos, reduced corneal sensation, and a blocked nasolacrimal duct in the left eye who refused to have surgery to treat the blocked nasolacrimal duct. Three months later, the patient came to the clinic with a hypopyon ulcer. The corneal ulcer as well as the level of pus in the anterior chamber can be seen in the left eye. Image shows a mucocele appearing as a raised nodule with blocked nasolacrimal duct. This condition should be treated. Uveitis or iridocyclitis, an inflammation of the iris and ciliary body, is one of the most common causes of blindness in MB leprosy patients. The iris and ciliary body, being anterior in the eye, are relatively cooler than core body temperature. Therefore, they form favorable sites for the growth of leprosy bacilli, which then induce the host response. Histopathological evidence shows that Mycobacterium leprae can reside in the eye long after MDT. Furthermore, sub-clinical iridocyclitis is common ,  (Figure 18). FIG 18 M. leprae in iris and ciliary. Image shows numerous acid-fast Mycobacterium leprae in the ciliary body of a lepromatous patient. These bacteria can trigger a host response and cause inflammation (iridocyclitis). Reproduced with permission . Copyright 2004, Br J Ophthalmol. Image shows Mycobacterium leprae within a macrophage in the iris of a lepromatous patient who completed two years of MDT. Since the eye is a secluded organ, the bacteria can exist there for a long time, even after receiving adequate treatment, and potentially cause iridocyclitis in the post-treatment period. Reproduced with permission . Copyright 1997, Br J Ophthalmol. Iridocyclitis in leprosy patients may be associated with other causes such as tuberculosis, syphilis, sarcoid, HLA B27, and rheumatoid arthritis. Investigations, especially in bacteriologically cured leprosy patients, must therefore include tests to identify these diseases and to distinguish them from leprosy relapse, thus facilitating the institution of all appropriate treatment. Iridocyclitis may be acute, typically occurring in borderline lepromatous leprosy, or chronic, typically occurring in lepromatous leprosy. Paucibacillary leprosy and tuberculoid leprosy rarely account for iridocyclitis. The symptoms of acute iridocyclitis include decreased vision, pain, photophobia, and lacrimation/watering. The signs include circumcorneal congestion or ciliary flush and reflex spasms of the sphincter of the pupil and ciliary muscle, leading to sluggishly reacting small pupils. The increased permeability of blood vessels causes leakage of proteins and inflammatory cells into the aqueous. The leakage is seen as cells and flare or, if severe, forms a settled white layer or hypopyon. (Hypopyon is however, more commonly associated with bacterial infection—see Corneal Ulcer.) Inflammatory cells are also deposited on the corneal endothelium as keratic precipitates and the intraocular pressure is often raised. In chronic low-grade iridocyclitis, ciliary body atrophy may change the aqueous dynamics, causing low intraocular pressure (Figures 19, 20). The clinical signs of acute iridocyclitis include a small pupil that sluggishly reacts to light and circumcorneal congestion (redness around the cornea). These signs can be seen in the left eye. Signs of iridocyclitis include an irregular pupil that reacts sluggishly to light. Here the pupil is irregular and stuck to the cataract lens below. A small area of the iris is attached to the top of the lens in this lepromatous patient who had iridocyclitis. Using strong mydriatics (dilating drops) could free this attachment and should be instituted sooner rather than later. Iris atrophy can result because of chronic iridocyclitis and can progress to polycoria. Reproduced with permission . Copyright 2006, Br J Ophthalmol. During iridocyclitis, flare and cells can be seen in the anterior chamber viewed through a slit lamp. In this image, there are cellular deposits at the back of the cornea called keratic precipitates. If left untreated or inadequately treated, acute iridocyclitis may result in long-lasting sequelae, even after the inflammation subsides. Two examples would be peripheral anterior synechiae (or adhesions) and posterior synechiae. In anterior synechiae, the iris adheres to the peripheral corneal endothelium; in posterior synechiae, it adheres to the lens at the pupil margin. Both of these conditions may increase the intraocular pressure, causing secondary glaucoma. In addition, the failure to treat acute iridocyclitis could result in iris atrophy and polycoria, or holes in the iris . Lens opacities or cataract secondary to prolonged uveitis itself or to the prolonged use of oral steroids to treat the uveitis can also result. Chronic iridocyclitis may follow episodes of acute iridocyclitis. It can also occur as a sub-clinical inflammation that gradually leads to iris and ciliary body atrophy. This type of chronic inflammation is typically seen in polar lepromatous leprosy. Type 2 reactions may be associated with iridocyclitis. The treatment of acute iridocyclitis should be prompt and rigorous. If the pupil is small or irregular, mydriatic drops must be instilled intensively at initial consultation to break any posterior synechiae present. If this treatment is not done early, the synechiae are likely to remain permanent. Atropine or other long-acting mydriatics should be instilled 1–3/times a day to prevent new synechiae from forming and to reduce pain by relieving ciliary spasms. Topical steroid eye drops are the mainstay of treatment. Prednisolone drops should be used at regular intervals during the day, starting with 6–8 drops a day and gradually reducing the frequency over a period of time as inflammation subsides. Steroid eye ointment may be used at night. Before starting on steroid drops, and during topical steroid therapy, the cornea should be examined for any epithelial defect or ulcer. If an ulcer develops, topical steroids should be withheld (but mydriatics continued) and the ulcer treated appropriately. Steroid drops may be re-introduced once the corneal epithelium is intact. A sub-conjunctival steroid injection may be required in cases with severe uveitis. Oral steroid therapy may also be necessary if there is persisting intense inflammation despite topical and sub-conjunctival steroid. Prednisolone 60 mg/day should be commenced, with the dosage tapered over one or two weeks depending on the response. Oral NSAIDs may also be administered to relieve the pain. If the intraocular pressure is high, ocular hypotensive medication should be commenced and can usually be withdrawn as the inflammation settles. Other immunosuppressive drugs such as methotrexate and mycophenolate mofetil may be used for treating refractory iridocyclitis. Clofazimine also may be used. A deeper inflammation may affect the sclera in lepromatous leprosy patients. Scleritis presents as a red (darker than episcleritis) eye with pain and tenderness. It requires aggressive treatment with steroid drops, usually with oral NSAID or steroids. If left untreated, thinning of the sclera may eventually occur, with or without a staphyloma (Figure 21). A dark red appearance and pain/tenderness are presenting features of scleritis. Scleritis can also present as a scleral nodule. Left untreated or inadequately treated, scleritis can lead to thinning of the sclera that can be seen as a bluish color on the sclera. Episcleritis: Episcleritis is localized redness and tenderness of the episclera and conjunctiva, with or without a nodule. Episcleritis is usually self-limiting, but may require topical steroid drops (Figure 22). Episcleritis appears as a reddish patch on the conjunctiva that can persist for a few days without discomfort or pain. Most episodes do not require any treatment, but persistent ones may require steroid drops. Glaucoma may occur due to treatment with steroids or due to uveitis. Intraocular pressure should be monitored by an ophthalmologist in patients with iridocyclitis or on prolonged steroid therapy. This monitoring is important to prevent irreversible blindness . 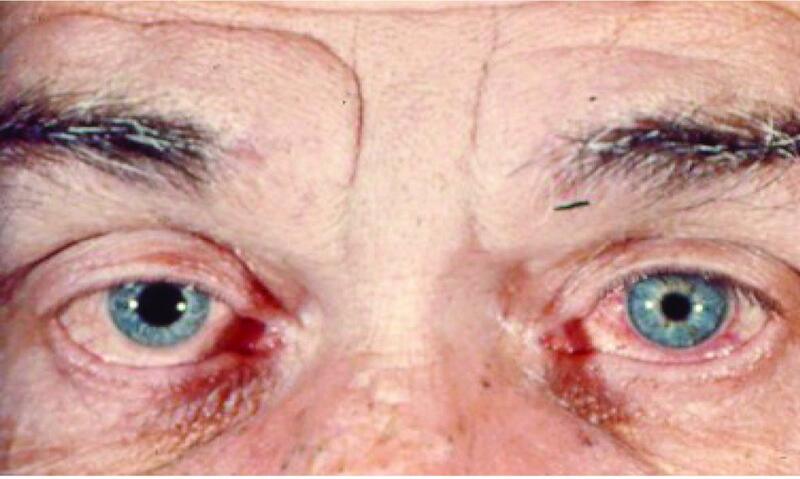 Other ocular complications may occur in lepromatous patients, particularly in older patients who lived through the period when there was no MDT. Thickening and nodules of corneal nerves: Transient, recurring thickening and opacification of corneal nerve fibers may occur, some becoming calcified and persistent (Figure 23). FIG 23 Corneal nerve beading. Corneal nerve beading in the cornea of a lepromatous patient seen through a slit lamp. Arrows point to the beading. Avascular punctate keratitis of leprosy: Avascular punctate keratitis of leprosy refers to small discrete, superficial opacities that are seen deep in the epithelium. They are commonly seen in the first decade of the disease, mostly near the limbus in the upper temporal quadrant of the cornea. These opacities, or globi, are made up of scattered groups of lepra cells, lymphocytes, and plasma cells. Groups of globi can become tightly packed and form “pearls”. The pearls may extrude through the epithelium, regress, or become calcified. A similar presentation may also be seen on the anterior iris surface (Figure 24). 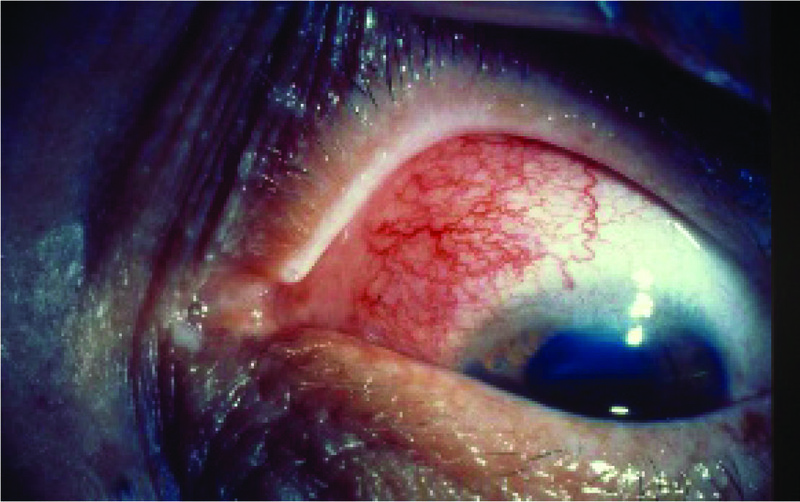 FIG 24 Avascular punctate keratitis of leprosy. White spots on the outer upper cornea in a lepromatous patient. Three small pearl-like structures can be seen at the edge of the pupil at the 6–7 o’clock position. A lepromatous pearl is evident at the 12 o’clock position. These are aggregated clumps of Mycobacterium leprae that have become calcified. They are not permanent and can disappear. Madarosis: Madarosis refers to the loss of eyebrows. Mycobacterium leprae invade and destroy the hair roots (see Chapter 2.4) in lepromatous patients. The condition usually starts laterally, affecting the outer two thirds of the eyebrow, and moving medially and symmetrically. Irritation of the eyes may occur when sweat runs into the eyes. Ciliary madarosis refers to loss of the eyelashes, which may also be seen in advanced lepromatous disease (Figure 25). 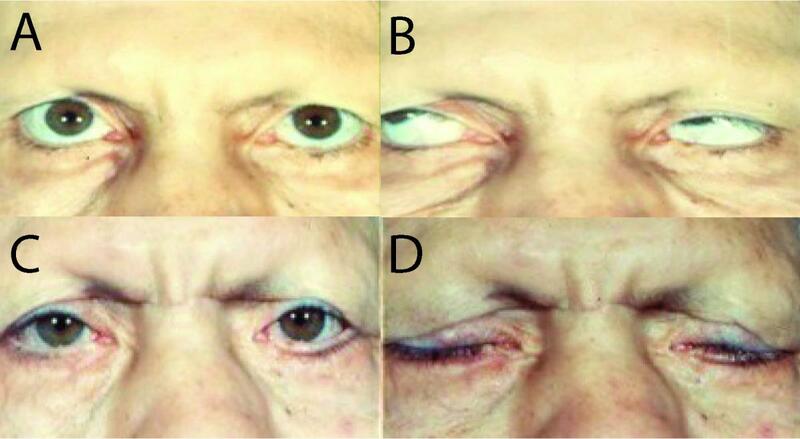 Bilateral madarosis (loss of eyebrows) in a lepromatous patient. Band shaped keratopathy: Band shaped keratopathy is a chronic degenerative condition of the cornea, not exclusive to leprosy, but seen in long-standing lepromatous leprosy patients. Calcification occurs across the middle third of the cornea, starting peripherally (Figure 26). 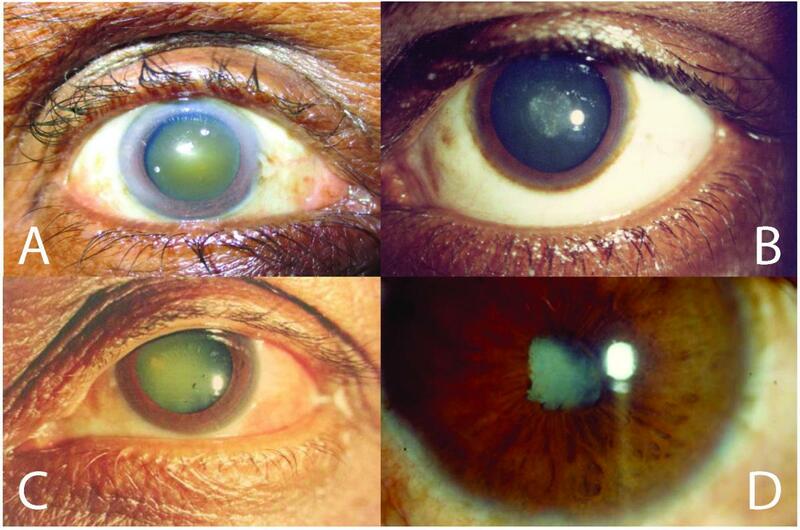 Band-shaped keratopathy in the eye of a long-standing lepromatous leprosy patient. Since most manifestations involve the anterior part of the eye, the examination of the eyes in leprosy does not require sophisticated ophthalmological equipment. Simple examination with a focused flashlight in a darkened room will help diagnose and record almost all leprosy-related manifestations in very little time, but it is important to do a systematic examination at every visit. Record the visual acuity in both eyes. This key information should be documented before every examination. Take a good history. The denial of symptoms in the presence of abnormality may indicate the loss of corneal sensation. An injury with vegetable matter may point to a fungal corneal ulcer. Co-morbidities such as diabetes mellitus, tuberculosis, and HIV can influence the manifestations and treatment. Ask the patient to close his or her eyes. It is important to ask the patient to close the eyes, even if the eyes look normal. Early lagophthalmos is often missed because this simple measure is neglected. Check the lacrimal drainage system. The regurgitation of tears, mucus, or pus from the puncta should be sought by applying pressure over the lacrimal sac region. Nasolacrimal syringing is mandatory in patients with reduced sensation and lagophthalmos or when there is any suggestion of nasolacrimal blockage. Check the cornea sensation or blink frequency. Corneal sensation should be physically checked only in an ophthalmologist’s clinic. In the field, observing the blink frequency (reduced in corneal hypoesthesia) is considered the best practice, rather than the prior practice of touching the cornea with a cotton wisp, due to the danger of causing an iatrogenic ulcer. Use fluorescein. The use of fluorescein drops helps to distinguish between a corneal ulcer, which soaks up the bright yellow dye, and a corneal opacity, which does not. Examine the pupil. It is important to examine the pupil position, size, and reaction. Check the intraocular pressure. Check for cataracts and perform a digital check for raised intraocular pressure. This latter check of pressure should not be done on patients with corneal abrasions or ulcers. An accurate tonometry is usually performed in an ophthalmology clinic. Educate. Finally, health education on the care of the eyes at home forms a necessary part of the consultation. Most blindness and impaired vision resulting from leprosy is preventable. Leprosy services have been integrated into mainstream general health care services in most countries around the world. This integration has widened our focus to include causes not directly associated with leprosy in combating blindness among such patients. These other causes are increasing in importance, but it remains essential to be able to diagnose and effectively treat the early features of specific ocular complications of leprosy. It is important to remember that patients, especially those who are cured bacteriologically, remain at risk of leprosy-related ocular complications before, during, and after MDT. It is also important to realize that visual disability and blindness are still strongly associated with stigma, ignorance, lower socioeconomic status, and neglect. Therefore, it is the responsibility of the care givers in leprosy, including health workers, physicians, and ophthalmologists, to work together with patients to help lower all barriers to accessible eye care. Research in the areas of corneal sensation, sub-clinical iridocyclitis, and eyelid and cataract surgery are imperative for increasing our knowledge and understanding, thereby providing the best eye care possible to the millions of cured leprosy patients around the world. We thank the late Dr. Margaret Brand, who passed on her vast experience of ocular leprosy to us. We also thank her for her ocular leprosy images used in this chapter and acknowledge the permission granted to us by the British Journal of Ophthalmology, the Jaypee Publishers, the International Journal of Leprosy, Professor Bhushan Kumar, and Professor Hemanta Kumar Kar for permitting the use of our previously published images in this chapter. ^ Daniel E, Ffytche TJ, Sundar Rao PS, Kempen JH, Diener-West M, Courtright P. 2006. Incidence of ocular morbidity among multibacillary leprosy patients during a 2 year course of multidrug therapy. Br J Ophthalmol 90:568–573. ^ Daniel E, Ffytche TJ, Kempen JH, Rao PS, Diener-West M, Courtright P. 2006. Incidence of ocular complications in patients with multibacillary leprosy after completion of a 2 year course of multidrug therapy. Br J Ophthalmol 90:949–954. ^ Courtright P, Daniel E, Sundarrao, Ravanes J, Mengistu F, Belachew M, Celloria RV, Ffytche T. 2002. Eye disease in multibacillary leprosy patients at the time of their leprosy diagnosis: findings from the Longitudinal Study of Ocular Leprosy (LOSOL) in India, the Philippines and Ethiopia. Lepr Rev 73:225–238. ^ Daniel E, Koshy S, Rao GS, Rao PS. 2002. Ocular complications in newly diagnosed borderline lepromatous and lepromatous leprosy patients: baseline profile of the Indian cohort. Br J Ophthalmol 86:1336–1340. ^ Grzybowski A, Nita M, Virmond M. 2015. Ocular leprosy. Clinics in Dermatology 33:79–89. a, b Brand ME. 1993. Care of the eyes in Hansen’s Disease (leprosy) (3rd ed). The Leprosy Mission International (TLMI), TALMILEP, Brentford, Middlesex. ^ Courtright P, Lewallen S. 1993. Guide to ocular leprosy for health workers. A training manual for eye care in leprosy. World Scientific Publishing Co. Pte. Ltd., TALMILEP, Singapore. a, b Hogeweg M, Keunen JE. 2005. Prevention of blindness in leprosy and the role of the Vision 2020 Programme. Cambridge Ophthalmological Symposium. Eye 19:1099–1105. ^ Thompson K, Daniel E. 1998. Management of ocular problems in leprosy. Indian J Lepr 70:295–315. ^ Daniel E, Sundar Rao PS. 2007. Evolution of vision reducing cataract in skin smear positive lepromatous patients: does it have an inflammatory basis? Br J Ophthalmol 91:1011–1013. a, b, c, d, e, f, g, h, i, j, k, l, m, n, o, p, q, r, s, t, u, v, w Ebenezer D. 2015. In Kar HK, Kumar B (ed), IAL textbook of leprosy. Jaypee Brothers Medical Publishers Pvt. Ltd., New Delhi, India. ^ Anand S, Neethiodiss P, Xavier JW. 2009. Intra and post-operative complications and visual outcomes following cataract surgery in leprosy patients. Lepr Rev 80:177–186. ^ Mpyet C, Solomon AW. 2005. Prevalence and causes of blindness and low vision in leprosy villages of north eastern Nigeria. Br J Ophthalmol 89:417–419. Erratum in: Br J Ophthalmol 89:787. ^ Daniel E, Koshy S. 2002. Intraocular lens implantation in leprosy. Int J Lepr Other Mycobact Dis 70:9–15. ^ Mpyet C, Dineen BP, Solomon AW. 2005. Cataract surgical coverage and barriers to uptake of cataract surgery in leprosy villages of north eastern Nigeria. Br J Ophthalmol 89:936–938. ^ Daniel E. 1998. Lagophthalmos in leprosy. Indian J Lepr 70:39–47. Review. ^ Daniel E, Rao PS, Courtright P. 2013. 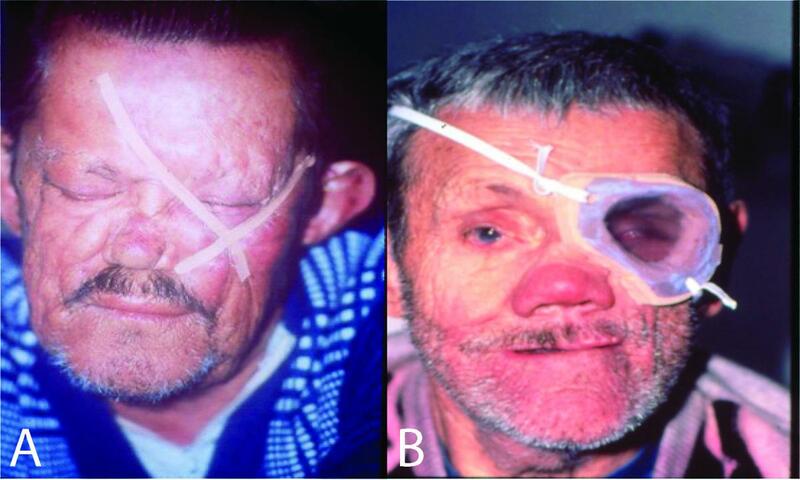 Facial sensory loss in multi-bacillary leprosy patients. Lepr Rev 84:194–198. ^ Hogeweg M, Kiran KU, Suneetha S. 1991. The significance of facial patches and type I reaction for the development of facial nerve damage in leprosy. A retrospective study among 1226 paucibacillary leprosy patients. Lepr Rev 62:143–149. ^ Thompson K, Brand M. 2003. Temporary tarsorrhaphy: a valuable procedure in Hansen’s disease [Comment]. Arch Ophthalmol 121:149. ^ Das P, Kumar J, Karthikeyan G, Rao PS. 2011. Efficacy of temporalis muscle transfer for correction of lagophthalmos in leprosy. Lepr Rev 82:279–285. ^ Soares D, Chew M. 1997. Temporalis muscle transfer in the correction of lagophthalmos due to leprosy. Lepr Rev 68:38–42. ^ Ahn SY, Park HJ, Kim JP, Park TH. 2016. Temporalis Muscle Transfer for the treatment of lagophthalmos in patients with leprosy: refinement in surgical techniques to prevent postoperative ptosis. J Craniofac Surg 27:94–96. ^ El Toukhy E. 2010. Gold weight implants in the management of lagophthalmos in leprosy patients. Lepr Rev 81:79–81. ^ Daniel E, Thompson K. 1999. Corneal sensation in leprosy. Int J Lepr Other Mycobact Dis 67:298–301. ^ John D, Daniel E. 1999. Infectious keratitis in leprosy. Br J Ophthalmol 83:173–176. ^ Gopalakrishnan K, Daniel E, Jacob R, Ebenezer G, Mathews M. 2003. Bilateral bipolaris keratomycosis in a borderline lepromatous patient. Int J Lepr Other Mycobact Dis 71:14–17. ^ Daniel E, Ebenezer GJ, Job CK. 1997. Pathology of iris in leprosy. Br J Ophthalmol 81:490–492. ^ Thompson K, Job CK. 1996. Silent iritis in treated bacillary negative leprosy. Int J Lepr Other Mycobact Dis 64:306–310. ^ Ebenezer GJ, Daniel E. 2004 Feb. Expression of protein gene product 9.5 in lepromatous eyes showing ciliary body nerve damage and a “dying back” phenomenon in the posterior ciliary nerves. Br J Ophthalmol 88(2):178–181. PubMed PMID: 14736767; PubMed Central PMCID: PMC1771971. ^ Daniel E, Ebenezer GJ, Job CK. 1997 Jun. Pathology of iris in leprosy. Br J Ophthalmol 81(6):490–492. PubMed PMID: 9274414; PubMed Central PMCID: PMC1722210. ^ Daniel E, Sundar Rao PS, Ffytche TJ, Chacko S, Prasanth HR, Courtright P. 2007 Aug. Iris atrophy in patients with newly diagnosed multibacillary leprosy: at diagnosis, during and after completion of multidrug treatment. Br J Ophthalmol 91(8):1019–1022. ^ Thomas R, Thomas S, Muliyil J. 2003. Prevalence of glaucoma in treated multibacillary Hansen Disease. J Glaucoma 12:16–22.